Nine “heirs” of the Sultan of Sulu have agreed to drop their claim on Sabah, saying they were now “willing to surrender their rights” to the North Bornean state. The Star newspaper quoted one Datu Omar Ali Datu Backtiyal as saying that he had obtained the signatures of the nine heirs of the late Sultan Mohamat Jamal Al Alam agreeing to relinquish their claim last year. Well, as far as this blog is concern, the so-called Sabah claim is just that — a claim; a footnote in a library of books. A footnote, therefore, cannot rise to claim to be the whole book. Let’s see… Sabah is being claimed by at least three parties — the Philippine government, Nur Misuari and the Sulu Sultan (whoever he is). I wonder why the preoccupation with Sabah when they could not even take care of their own backwater — those islands in the Sulu Sea. I guess it has got to do with looks. Sabah is beautiful and prosperous. Their backwater, though beautiful but due to decades of neglect, is no longer attractive. Tell you what, why don’t someone among the Sulu heirs make a reverse claim… ask the Philippine government to let go southern Philippines and then apply to join Malaysia as its 14th state? Then they can make one of the Sulu Sultans the Yang Dipertua Negeri Sulu and appoint someone from the area as the Chief Minister and form a whole cabinet. That way, we can co-exist nicely. Then we can develop together. Heck, we can make the waters in the east coast of Sabah and the islands towards the east as the Caribbean of the East. But the people of Sulu should promise one thing la… they will have to surrender their guns to the authorities. 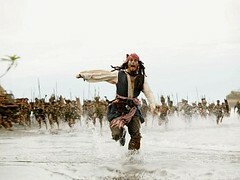 We want no Jack Sparrow in the Caribbean of the East. The people should now fight another kind of war, the one fought in the economic battlefront. What say you?